Meera Infotech has been providing professional custom web design, web development and hosting solutions to all business industries Internationally. Meera Infotech are a Website Designing and Development Company located in Bandra (W), Mumbai, that provides Professional Website Designing and Development Services, Web Promotion Services, Website Maintenance Services, E-Commerce Web Development, Graphic Designing, Flash Animation, Hosting, Intranet Application Development, Print Design, Logo design, Blog writing, Custom Form development, Web site programming and more from Mumbai, India. Our professional Web Design Services will give your business the look and feel needed to beat your competitor sites. 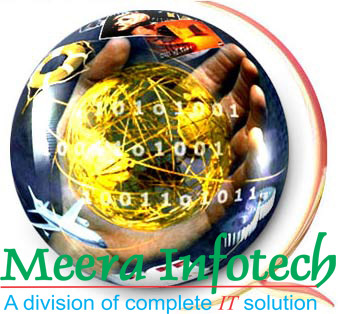 Meera Infotech can help you with the knowledge and strategy needed for good results on the Internet. Meera Infotech always designs websites using search engine friendly techniques and submits your web site to the search engines. Meera Infotech is one of the most affordable website design services available in Mumbai, India. When you choose Meera Infotech to work on your website, you will work directly with a website designer. Meera Infotech will develop your website to reflect your company's needs. Performing well on search engines is yet another important factor. Just from the beginning, your website is custom-designed to ensure complete compatibility with search engines. Meera Infotech will design your web site help with web promotion and internet marketing. Meera Infotech can develop a navigation structure based on the content you'd like to publish on your website. This you can do from an administration area which Meera Infotech creates wherein you can easily add, update or delete the content at any time. This Custom web design feature also lets you add/update business specific images thereby not restricting the flow in any way. Eye catching graphics, fast loading pages, pleasing typography, easy navigation are the hallmarks of a good website. Moments offers affordable customized design services to meet any needs.